Synopsis: Asha lives a poor lifestyle along with her widowed dad, is in love with aspiring doctor Raj Kumar, and hopes to marry him someday. When Raj announces that he is traveling abroad to study, she decides to wait for him, but her father, on his deathbed, makes her promise to marry Simla-based Gopal Chopra, who is the son of his friend, Shyamlal, to which Asha agrees. The marriage takes place and soon they become parents of three daughters, Basanti – a tomboy, who excels in self-defense; Barkha an aspiring dancer, and Bulbul who wants to be a professional piano player and is on medication as she has a hole in her heart. Gopal gets a promotion and re-locates to Bombay but continues to remain in touch with his family. Then the past is re-visited when Raj, now a doctor, comes to live in their neighborhood. He meets with Asha, and decides to teach Bulbul piano lessons, while his brother, Advocate Anand, romances Basanti. 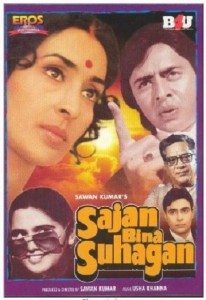 Their idyllic lives are shattered when Raj is arrested for killing a man named Mangatram who was blackmailing Asha for hiding a secret from the rest of her family.